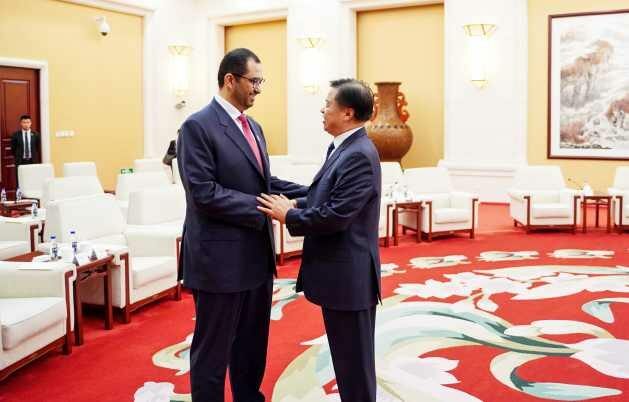 BEIJING, Jul 9 2018 - Dr. Sultan Ahmed Al Jaber, UAE Minister of State and Abu Dhabi National Oil Company (ADNOC) Group CEO, held a series of meetings with Chinese oil, gas, refining and petrochemical industry leaders, focused on expanding and deepening investment and partnership opportunities across ADNOC’s integrated Upstream and Downstream value chain, during a visit to Beijing. Dr. Al Jaber was in the Chinese capital as part of the effort to expand and deepen business and economic relations with one of the UAE’s largest trading partners. During the visit, Dr. Al Jaber met with senior executives from the Wanhua Chemical Group, one of the world’s largest producers of Methylene Diphenyl Diisocyanate (MDI), which is used in the production of rigid polyurethane; China National Petroleum Company (CNPC), a major state-owned Chinese oil and gas corporation and one of the largest integrated energy groups in the world; the China National Offshore Oil Corporation (CNOOC), China’s largest producer of offshore crude oil and natural gas. Dr. Al Jaber also met with representatives from the China Development Bank and the Vice Chairman of the National Development and Reform Commission (NDRC). At the meetings, Dr. Al Jaber discussed ADNOC’s plans to develop new Upstream oil and gas resources and to expand ADNOC’s Downstream operations, which will see production of petrochemicals triple to 14.4 million tons per annum by 2025. As announced earlier this year during ADNOC’s Downstream Investment Forum, the company is making significant investments in new Downstream projects, both domestically and internationally, to grow its refining capability and expand its petrochemical production three-fold to 14.4 mpta by 2025. Planned projects include a world-scale, mixed liquid feedstock Naphtha cracker, as well as investments in new refinery capacity. As a result of the planned expansions in its Downstream business, ADNOC will create one of the world’s largest integrated refining and petrochemical complexes at Ruwais, located in Abu Dhabi’s Al Dhafra region. The agenda also touched on ADNOC’s new licensing strategy announced earlier this year, which will see six offshore and onshore exploration, development and production blocks made available for competitive bidding. “The release of the six blocks for competitive bidding represents a rare and exciting opportunity to invest in the UAE’s stable and secure exploration and production sector, as we accelerate delivery of a more profitable Upstream business and generate strong returns for the UAE. At the same time, the expansion of our Downstream portfolio will allow partners who contribute finance, give access to technology and knowledge and facilitate market access, to invest and benefit, with us, from the growing demand for petrochemicals, particularly in Asia,” Al Jaber said. Over the past 14 years, the UAE and China have established a number of partnerships in the UAE’s energy sector, starting in 2014, when ADNOC and CNPC established the Al Yasat joint venture. More recently, in February 2017, CNPC and China CEFC Energy were awarded minority stakes in the UAE’s onshore oil reserves; and in March of this year, CNPC, through its majority-owned listed subsidiary PetroChina, was granted a 10% interest in each of the Umm Shaif and Nasr and Lower Zakum offshore concession areas. Meanwhile, ADNOC remains focused on market expansion in China and Asia, where demand for petrochemicals and plastics, including light-weight automotive components, essential utility piping and cable insulation, is forecast to double by 2040. China is the largest export customer in Asia for Borouge, a petrochemicals joint venture between ADNOC and Borealis, accounting for 1.2 million tons per year of polyolefins, equal to one third of its sales worldwide.